Our farm plants mostly follows the biointensive method, which was largely popularized by an amazing man named John Jeavons. More on him later, but the basic idea of biointensive growing is to grow a lot more food on a lot less land while maintaining and improving the soil and considering other aspects of sustainability like water use. Jeavons' biointensive model is mostly directed at small, subsistence type gardens and it has been wildly successful helping growers in developing countries like Kenya. 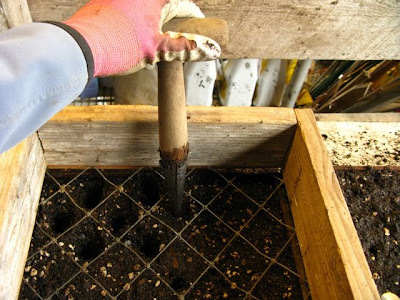 Biointensive requires labor and don't necessarily scale easily -- for example, planting in extremely close-set hexagonal patterns rather than rows makes drip irrigation difficult to install and makes weeding with a hoe mostly impossible. So here at Synergy, the farmers have done all they can to adopt the aspects of biointensive that make the most sense and tweak other pieces to fit the requirements of a market garden. One of the parts of biointensive that we do use, that's different from some other types of farming is the process of "flatting and pricking out." Many farmers sow seeds directly into the ground, sometimes by hand, often with a tractor with a seeder attachment or another type of tool. Seeding bush and pole beans into a flat with 1'' spacing. 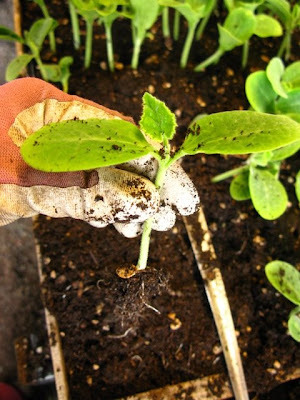 This process of seeding, pricking out, and then transplanting into a bed accomplishes a few different things. The first four are things Jeavons notes in his most famous gardening book, the last one is something we've taken advantage of here on the farm. 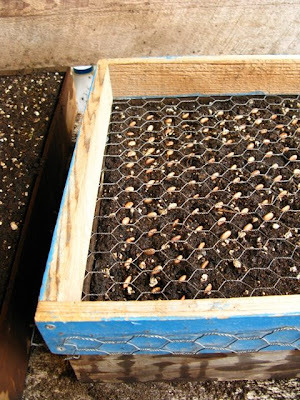 Saving water: Starting seeds in flats uses less water than direct seeding. 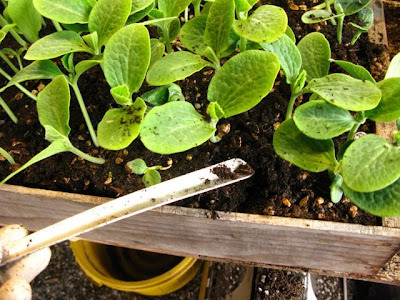 Transplanting stimulates plant growth: Moving seedlings into a new environment with fresh, loose soil means they have a chance to snack on fresh nutrients in new dirt that hasn't yet been compacted. 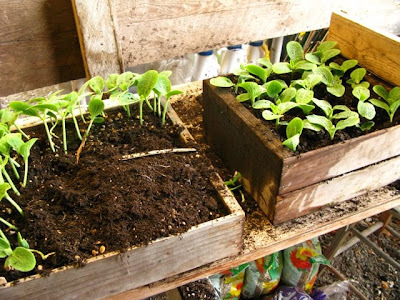 Many flats can live in flathouses or coldframes, which is an easy and economical way to lengthen the growing season: Flatting seeds and keeping them warm in our flathouse allows us to get a headstart on some plants weeks before the outdoor soil temperatures (and even greenhouse temperatures) are high enough. 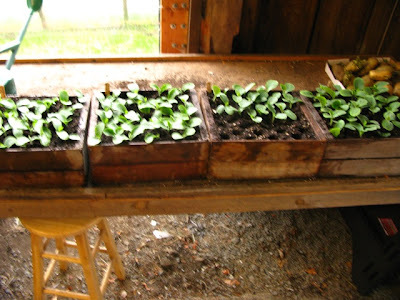 1 shallow flat of squash seedlings will fit into 3 1/2 deep flats. I pricked these out back in may; first, I prepped the soil in the deeper flats, a mix of half old stuff and half new potting mix from Gardner and Bloome. Then I water in the flats with a can and check the dampness with a water meter -- around 7 will be perfect for planting. Be careful of too much water -- seeds can drown! The dibber (best name ever?!) pokes holes big enough to accomodate the plants' roots. They're spaced 2'' apart with the help of the fencing frame I put over the top. 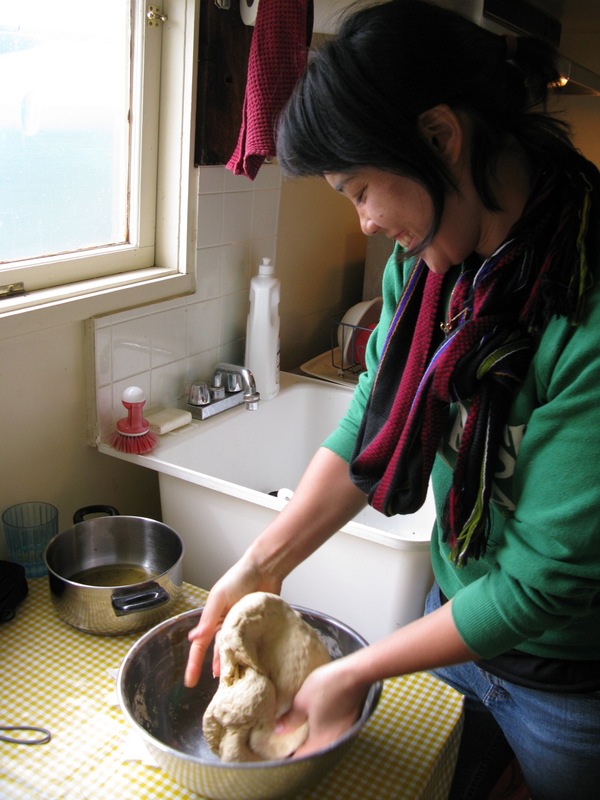 Then I carefully use the widger (or maybe this is the best name ever?) 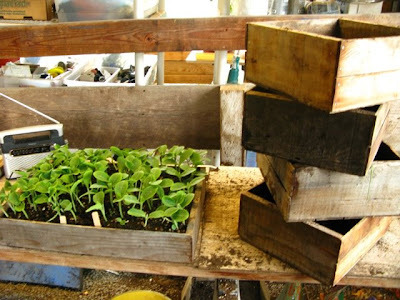 to lever out a seedling. Its roots are intact, but not too long -- they haven't started compacting or crowding too much with the other plants -- just in time for pricking out! 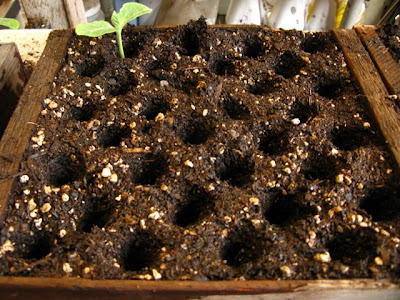 The little seedling is placed into its new hole in the deep flat and I fill in the space around it. The stem is buried slightly to provide extra support, but I make sure to keep all the "growing parts" above the soil. One deep flat finished, 2.5 to go! what you are doing is absolutely amazing. I admire your vision and passion into doing what you do- the world needs more people like you! are you growing any swiss chard or aguila? Thanks Jodie! I really do hope that more young folks get into farming, especially here in the states. I am having so much fun doing this I feel lucky to have found such a wonderful farm where I can learn. We do grow chard -- right now we're growing a variety of rainbow chard called Bright Lights -- it's absolutely gorgeous -- the stems are sun yellow, bright pink, deep red, egg-yolk orange. Arugula is pretty much finished -- the plants have bolted (they've become mature, started to grow little flowers, and become very bitter) which happens when the weather gets hotter. Jess, I wish u could stay in Cambodia longer, so I could read about ur opinions of being here. I read all of ur posts in the other one, but it's okay, I like this one as well. That's sad you had to leave, really! PS: I used to comment about Raja before, remember? Hi Nathary! Yes, I remember you! I hope to get back to Cambodia someday, but I'm glad that you're interested in farming too. Lollin' at widger and dibber! So, how does the water meter work? 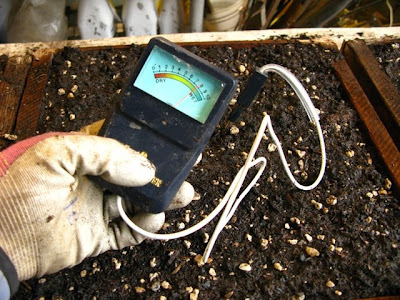 Like, how does it determine how damp the soil is?